Stop & Start systems are everywhere nowadays. In Europe, most newer models come with one fitted as standard equipment, stopping the engine from idling when the car is at a stoplight. Economy is significant, but Panasonic says it could be better. What’s at fault is the poor performances of lead-acid batteries. So Panasonic, Toyota’s battery supplier for the Prius, had the idea of adding a small NiMH battery between the standard lead-acid battery and the electric motor. The engineers have designed a pack which uses D cells (just like some big radios). There’s ten of them, all 1.2V NiMH cells, to arrive at the 12V voltage that is standard in cars. So there’s no need for voltage transformation nor for a long cable as the cells have been designed with the ability to withstand high temperature. 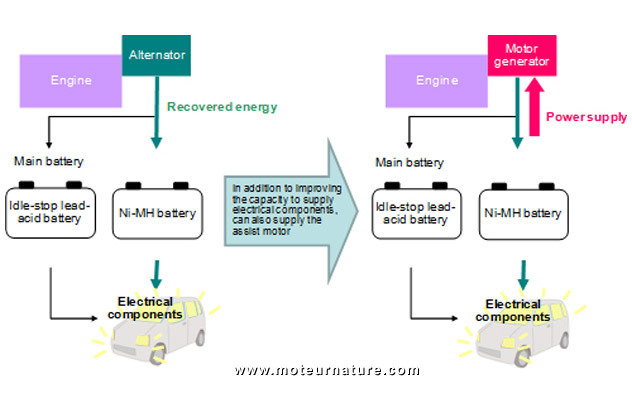 The battery can be located at the most convenient place under the hood, and this NiMH unit can then help to maximize the advantages of a Stop & Start system, because it stores more energy to power all the accessories (radio, defroster, windows…), while it preserves the life of the base lead-acid battery. Panasonic hopes that with the addition of its little battery, the gain in efficiency from a Stop & Start can be doubled. That is quite optimistic in my opinion, and the best thing about this system is probably its price. High quality NiMH D cells can’t cost a fortune, and even if it makes a Stop & Start only 30% better, it’s probably worth it.